It's the 4th of July here in the US, but before we fire off some "disruptors" of our own, we have a VERY important tradition that we must follow - giving you guys a new episode of Star Trek: Asterisk! 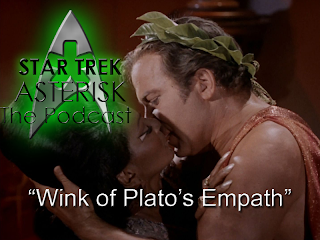 Join us this week as we wrap up three more episodes from season 3 of The Original Series: "Plato's Stepchildren", "Wink of an Eye", and "The Empath". Open a box full of fun here. If you haven't already, be sure to go back and read Steve's written reviews, and check out this past week's Officer's Lounge. Plus, HAILING FREQUENCIES ARE OPEN at 513-ASTRISK (278-7475) for all of your questions or comments about Star Trek or Star Trek: Asterisk. Finally, be sure to join us this and every Thursday at 6PM Eastern for the live show. Now get out there and blow something up - for America!! Oh, and be safe, huh?